Indigenous human rights defender Ms Gloria Ushigua, has been a target of increasing levels of harassment over the past month, as a result of her peaceful and legitimate work in defence of environmental rights and of her ancestral land. On 31 May 2016, five men sat outside Gloria Ushigua's home throughout the night, in what appeared to be an act of intimidation against the human rights defender. This follows another act of intimidation against her niece on 26 May 2016 and the killing of the human rights defender's sister-in-law, Anacleta Dahua Cují, on 2 May 2016. Gloria Ushigua is Coordinator of the Sápara women's organisation Ashiñwaka, which defends the Sápara people's ancestral land and environmental rights in the province of Pastaza. Since 2010, the human rights defender has been invested in the defence of her community in Llachama Cocha, primarily against private and State-owned companies seeking to exploit oil deposits in Sápara territory. As a result, she has been threatened, intimidated, judicially harassed, discredited on national television by high public officials and assaulted by law enforcement officers, along with other members of her family. There have been escalating acts of intimidation against Gloria Ushigua in the past month including an assassination attempt on her life, which in a case of mistaken identity, resulted in the killing of her sister-in-law, Anacleta Dahua Cují, on 2 May 2016. Anacleta Dahua Cují was brutally murdered by four men as she was working on the land in her community of Llachama Cocha, where Gloria Ushigua also lives. Due to the signs of struggle and the injuries Anacleta Dahua Cují's body sustained, her relatives strongly believe that she was raped before she was killed. Following this, on 26 May 2016, four men surrounded Gloria Ushigua's niece, Ms Casiela Grefa, and physically restrained her and interrogated her about her aunt's whereabouts and activities. This is not the first time the human rights defender has been the subject of harassment. On 19 August 2015, three policemen broke into Gloria Ushigua's house in the city of Puyo. They shocked the human rights defender with tasers and beat her badly. The police also used tear gas inside the house causing Gloria, and those present including children, to almost suffocate. The human rights defender's office and property, including her fax and desk computer, was destroyed in the raid. In December 2013, government-owned TV channels broadcast a programme that discredited Gloria Ushigua and other indigenous human rights defenders. 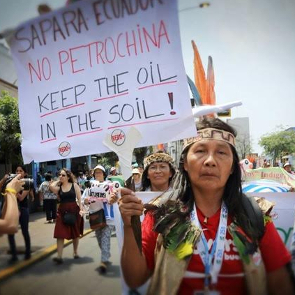 This smear campaign came shortly after a demonstration by indigenous people, including Gloria Ushigua, on 28 November 2013 outside the Secretariat of Hydrocarbons, where they protested against the bidding of land for oil exploration in the Amazon. In a particularly racist remark, TV anchors referred to Gloria Ushigua's traditional Sápara clothing as a clown costume. The smear campaign lasted over two weeks. In the same month the human rights defender was notified of charges against her that included terrorism, sabotage and public obstruction, despite the fact her personal behaviour was peaceful throughout the march. She was summoned to make a declaration about the demonstration and was called again in January 2014 to a hearing. To date, the charges against the human rights defender have not been dropped, forcing her to incur costly fees for her legal representation in what is clearly an instance of judicial harassment . In October 2015, the human rights defender was invited along with other female indigenous leaders of Ecuador to provide information about the situation of her community in a hearing held during the 156th session of the Inter-American Commission for Human Rights (IACHR). Her testimony and that of other human rights defenders revealed a pattern of relentless persecution against indigenous peoples of the Ecuadorian Amazon, as a result of their activism to preserve their ancestral lands, language and culture. This persecution is in contravention of the United Nation's (UN) Declaration on the Rights of Indigenous Peoples, which Ecuador supported at the UN General Assembly on 13 September 2007. I am deeply concerned about the safety of Gloria Ushigua, particularly considering the direct targeting of her family members and the increasing levels of violence being used against her. I express further concern about recent and increasing persecution and intimidation against indigenous and environmental rights defenders, particularly those participating in peaceful demonstrations in Ecuador. 5. Guarantee in all circumstances that all human rights defenders in Ecuador are able to carry out their legitimate human rights activities without fear of reprisals and free of all restrictions, including judicial harassment.